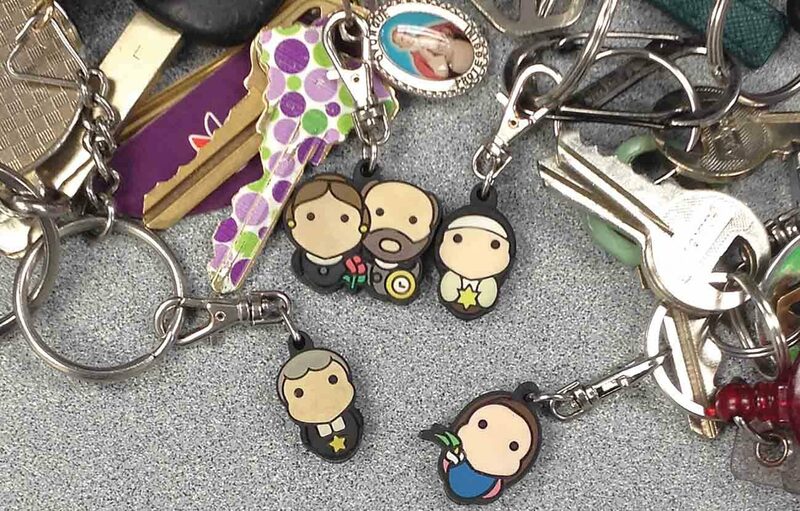 ARLINGTON, Va. (CNS) — Small, colorful plastic Catholic saints can be seen hanging from key chains, zippers and backpacks alongside Hello Kitty and Pokemon. They’re called Tiny Saints, and founders Joe and Colleen Klinker conceived the idea as they explained the death of their stillborn daughter, Melody Paige, to her older siblings. The loss of their daughter was unexpected and devastating. It also prompted questions from their children Gracie, 9, and JT, 8. Death was a topic the Klinkers hadn’t anticipated discussing until much later, but it opened a conversation about heaven and who Melody was with there. Joe and Colleen, former parishioners of Church of the Nativity in Burke who now live in Florida, began to tell their children stories about saints. But the images they found online didn’t resonate with their children. To bridge the gap, they created tiny, simplistic images of saints. “Most saints don’t have the appeal to children, unlike Disney or Hello Kitty,” Joe told the Arlington Catholic Herald, newspaper of the Diocese of Arlington. Their digital drawings captured their children’s gaze. JT imagined St. George playing swords with his little sister, while Gracie pictured Melody chasing after butterflies with St. Kateri Tekakwitha. “We weren’t going to fall down as a family, and we weren’t going to allow our children to miss out on the grace that comes from a loss like that,” said Joe. Noticing their children’s reaction, the Klinkers decided there was a potential market. In 2013, they created Tiny Saints. Joe’s brother, Mark, joined the team and guided the artistic vision. Just a few weeks after starting their online store, tinysaints.com, their products were available in 10 stores. Today, Tiny Saints can be found in about 175 bookstores and gift shops nationwide. Their product line now includes rosaries, bracelets and a children’s book. Since then, Mark left and Colleen took on his role in the company. In 2015, Joe left the U.S. Coast Guard after 12 years, and moved the family to Winter Garden, Florida, to run Tiny Saints full time. Tiny Saints changed from a necklace to a charm, about the size of a quarter, with a clip above the saint’s head to make it very portable. The communion of tiny saints now numbers more than 100. The Klinkers add saints to the lineup and suggestions come via email from their website. Two factors are taken into consideration: how helpful will the charm be to people, and how profitable will it be. The design process begins with research and prayer as Joe gets to know the saint. He reviews popular imagery of the saint and sometimes takes creative liberties, such as putting St. Agatha in pink clothing to reflect her role as the patron saint of breast cancer. Once the design is finished in Adobe Illustrator, Joe sends the digital file to their overseas manufacturer, whom he credits with bringing the charms to life. Sometimes a particular saint is selected because it relates to current affairs, such as St. Thomas More during the presidential election. “One of my favorites is St. Sebastian,” he said. “Obviously, we had to put the arrow in his chest.” St. Sebastian was put to death in the third century by a troop of archers. They hope to double the roster of saints to 200. The newest saint is St. Francis de Sales, the patron of writers and journalists. The company has donated hundreds of its products to missions in areas, including Haiti. Because the charms are weatherproof, they can withstand harsh climates. Tiny Saints can be an introduction to a saint that might lead to a conversation or a prayer. If the church were a swimming pool, Joe said, Tiny Saints could lead people deeper into their faith. Joe admits that until he created Tiny Saints he had no special devotion to the saints. He credits Melody for introducing them. “This beautiful church that we’re a part of can be overwhelming and terrifying after 2,000 years. I think that’s what Pope Francis is getting at: Go back to these simple things, get to know the saints,” he said. Bergeron is a staff writer at the Arlington Catholic Herald, newspaper of the Diocese of Arlington. I am interested in purchasing from Tiny Saints. There is no information about the items.